Slowly but surely we’re starting to see the retail locations around Costco fill in. It took a while to get anything but a bank/credit union in there but the last few years have been pretty good to us with new restaurants. We’ve really enjoyed having MOD Pizza so close and we treat the kids quite often with Menchines. The first restaurant that opened, Firehouse Subs has been a go-to when we just want a quick sandwich. 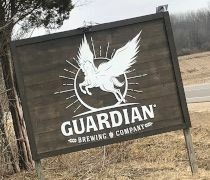 The next place to open just added a second Kalamazoo area location. 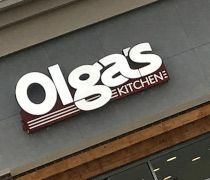 Olga’s Kitchen opened up on Century Avenue right next to that MOD Pizza in the Corner @ Drake shopping plaza. The large corner spot is visible from both Drake and Stadium Drive so it’s hard to miss when you’re driving by. I was pretty bummed when Kelvin & Co. close their downtown Kalamazoo location in the midst of last summer’s construction season. I get it. The whole point of running a business is to make money and if that’s not happening, it’s time to close. The Oshtemo location is still around not only is it closer to where I live but they also offer UberEats…so yeah, I still get my BBQ fix. This past week, I was in Grand Rapids for work. It was dinner time and I was near Eastown. I was trying to think of what I could grab quickly when I remembered Kelvin & Co was adding a location in that area. 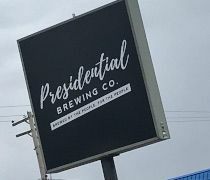 I had no idea if they were open or not until I did a quick Google search and found that they were. 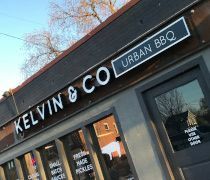 Kelvin & Co Urban BBQ Wealthy Street & Ethel Avenue in Grand Rapids’ Eastown Neighborhood. The building is pretty familiar to me. It used to be an Italian beef place called Big Willy’s. 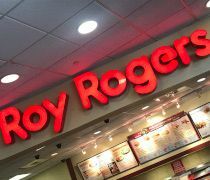 I ate there almost every time I went to Grand Rapids after the place opened. As someone who has been blogging about food for almost 11 years, I shouldn’t get all that excited when a new chain restaurant opens in town. If it’s a McDonalds or an Applebees, or something we already have, I don’t. 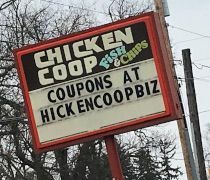 My enthusiasm for chains gets even higher when it’s more of a regional chain and if you want to narrow that down to just Michigan, well, hell, it might as well not even be a chain. Of course I’m excited about it. 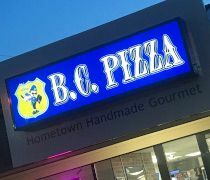 BC Pizza is the newest chain take-out/delivery pizza joint to pop up in Kalamazoo. They’re a northern Michigan pizza chain with the previous furthest south location being in Dorr.